I dreaded this match so much. I knew the usual suspects were going to punish us. And they did. But no one could have foreseen Milan playing on 10 men for most of the match. And no one could have foreseen that this would be the catalyst to make this team fight harder than they have in a long time. Or maybe it was the protests from the Curva. Nah, they did that before to no avail. But certainly, especially for those of us who were up early, we got more than we bargained for. It started badly and got worse, but it didn't stop our boys from trying. The big news was that Abbiati was shown red not five minutes in and Parma awarded a penalty. My commentators called it an “Abbiati error,” but the thing is as a keeper, you have a split second decision to make, especially when you are in a 1v1 situation. You either stand your ground or run out. Keepers are trained to run out in 1v1 situations to close down the shot, and so Abbiati actually tried to do the right thing. He even got a touch on the ball, but he also unfortunately took Schelotto out. So Milan played all but those five minutes on 10 men. Essien was sacrificed for Amelia. And guess who stepped up to take the penalty for Parma? That’s right, Cassano. And he converted it in the ninth minute. 1-0 Parma. What happened next surprised me. Our boys dug in and got right back into the game. A couple of shots by Balotelli, including one that hit the post were heartstopping. Big Game Bonera™ showed up and made a fantastic clearance in the 26th. And then, of course, the yellow cards started appearing. First, one for Bonera in the 30th for a foul on Schelotto, then one for Mexes in the 39th for a dirty little foul on Cassano. Montolivo also stopped a Cassano shot with his face, he really took a beating today. In fact, he had to go to the hospital after the match, he took such a beating, so let’s hope he’s okay. But we really did get more than we bargained for, especially with Amelia’s great save in the 43rd and Abate putting in nice crosses for Balotelli in the 45th. But could Milan play past the 60th minute, especially down a man? In the 51st, Cassano scored again. 2-0 Parma. But an unusual sub from Seedorf almost saved the day. He brought Rami on for Urby in the 53rd, an immediate reaction to the goal. And wouldn’t you know it, Rami scored in the 57th. A header. From a Kaka corner. 2-1 Parma, and our boys weren’t giving up just yet. A feeling of dread filled me as I saw Amauri come on for Cassano. Amauri has always haunted us, no matter which colors he wears. But Seedorf brought Pazzini on for Bonera in the 66th, so I was distracted for a bit. 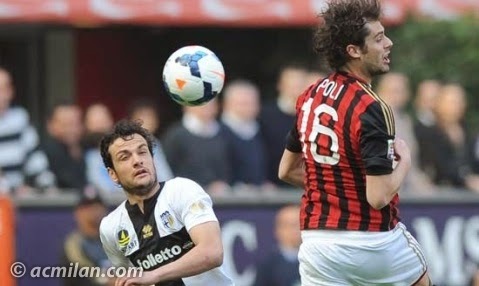 Especially because Pazzini was almost immediately fouled by Marchionni, who got a yellow for his efforts. Then in the 75th, Obi, who had just come on for Marchionni, got a yellow for taking down Montolivo in the box, and Milan were awarded a penalty. Balotelli stepped up, cool as ever, and converted that penalty in the 76th to make it 2-2. But that dread came back in the 78th as Amauri shot over a downed De Jong to nutmeg Amelia and break my heart again, 3-2 Parma. Luckily, Rami was there to rough up the Brazilian a bit for us, but unluckily, he was shown a yellow for a pretty bad foul on Amauri in the 82nd. Milan were still fighting, but only took 13 shots with 3 on goal, having 49% possession in the match. Meanwhile, Parma had 20 shots with 6 on target, including the diving header Biabiany scored in the final seconds, 4-2 Parma. It certainly wasn’t our best effort, but it was still more than I expected, particularly going down to 10 men so early. I don’t buy into the hysterics of the Curva Sud or others this week following our Champions League exit. Many of the questions they raise should have been addressed during the mercato, not after heartbreak and disappointment have set in. It doesn’t do anyone any good now to sling mud at a beleaguered team who are trying their best. I mean if this team played this well on ten men with their own fans chanting against them, what could they do with fans who actually cheer for them? Plus, I still have hope that we can see some more good performances this season. People who follow the club have seen the errors made in the mercato, there is no need to get upset now about what we’ve known all along. And I also disagree that these players are so terrible. No one said that about them when they played three games in a row so well. But thanks to the usual perpetrators, some drive from our boys, and a Curva who seem kind of slow and destructive, today, we really got more than we bargained for.